Condo has 2 bedrooms, 2 full baths, king in master, queen in 2nd bedroom. Luxury 5th floor unit, custom granite & marble counter tops in kitchen & bathrooms, covered parking, large heated pool, tennis court, barbecue grill, bike racks, fish cleaning table, waterfront gazebo, free boat slip, easy boating access to Gulf of Mexico. Bait & Tackle shop located across the street. Short walk (1/2 mile) to public Bonita Beach, and short bike ride (approximatley 3 miles) to Barefoot Beach State Preserve park. Beautiful sunsets, nature preserve, and undeveloped white sand beaches as far as you can see! Flat screen TV's in every room! (60" 4k HDTV in living room, 40" 4k TV in master bedroom, also 32" 1080p flat screens on lanai and guest bedroom / den - all of them connected to cable TV service and Netflix). Blu Ray DVD, surround sound stereo, fully stocked luxury kitchen, telephone with free US long distance, high speed internet with WiFi included. Several very nice public golf courses within 10 minutes drive time. Little Hickory Bay and the surrounding waters are a kayaker's dream! There are many backwaters to explore that only the kayaker's can get to. Bring your fishing pole, because the snook and red drum fishing is incredible! Fisherman's paradise! : Active marina and bait shop is just across the street from Little Hickory Bay. You can get your bait, or book a fishing charter by simply walking across the street to Fish Trap Marina. Also, another well stocked local fishing tackle and bait shop is less than 1 mile away on Bonita Beach Road. We are originally from Ohio, but have lived in Florida for the last 23 years because we love the warm Florida weather, the sunshine, the beautiful beaches, boating, and fantastic fishing. We have rented several privately owned vacation properties in various locations around Florida using online listings to find our vacation homes in years past. As a result of being a 'customer' of online vacation rentals on many occasions, we know that you want to stay at a nice place and rent from someone you can trust. We strive to keep our vacation home in top condition, and will do whatever we can to make your vacation very pleasurable and stress free! The location of our vacation home in beautiful Bonita Springs is perfectly situated for anyone that wants it all without being in the crowds of Naples or Fort Myers Beach. Both Naples & Fort Myers Beach are a very short drive in either direction, but Bonita Beach is situated directly between them both and just a short walk from our condo. For the beach lover, the boater, the kayaker, or the fisherman, our vacation home is your paradise! For those of you that like to bicycle, jog, or walk for exercise, our vacation home will give you plenty of options to help you maintain your fitness on the great beach front sidewalks that are directly west of our vacation home. You will also love the beautiful bike ride back to the Barefoot Beach State preserve - just a couple mile ride through a gorgeous neighborhood full of beautiful multi-million dollar waterfront homes to get to the untouched white sand beaches at the preserve. Barefoot Beach Preserve is our favorite beach to visit when we stay here and the bike ride to get there is beautiful. If you have a kayak or canoe, or wish to rent one just down the street (or by water via a short canal) from our condo, your on-water exploration options are limitless... 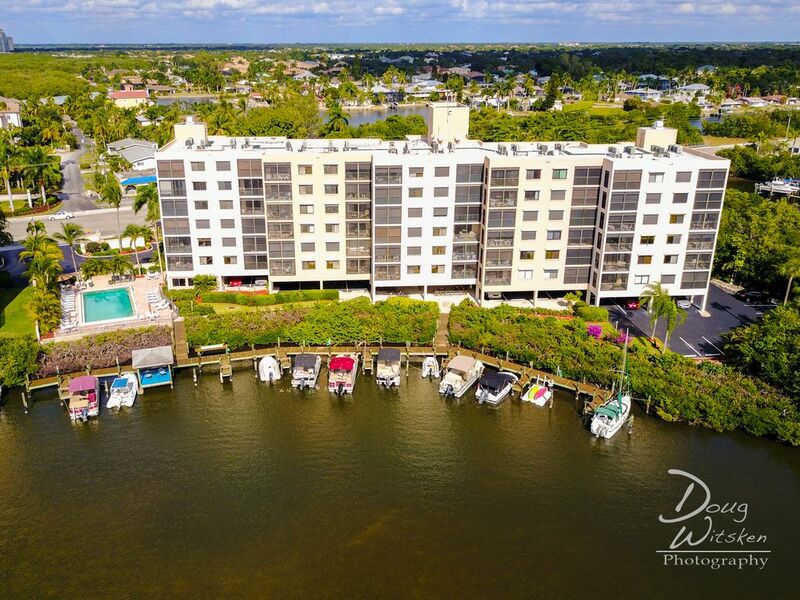 The waters behind our condo are connected by inland water ways to anywhere you have the energy to get to in all of Southwest Florida. outdoor shower, By the pool. Each bathroom is contemporary with tile floor, custom glass shower & tub enclosures , custom cabinetry with beautiful marble vanity tops. Public access to Bonita Beach is less than half a mile away and is an easy walk down the sidewalk. Also, the Barefoot Beach Preserve park is a short bike or car ride and is highly rated by Dr Beach! Delnor-Wiggins State park is a 10 minute car ride to the south, and Lovers Key State park is less than 10 minutes north on Bonita Beach road. Barefoot Beach is our favorite and is less than 2.5 miles. The property overlooks Little Hickory Bay which is connected to the Gulf of Mexico via a short boat ride without any bridges to go under between here and the Gulf! Fantastic views of the sunsets over Little Hickory Bay. Boat docks are right behind the condo and great fishing awaits! Fantastic place for kayaking and paddle boarding. Brand new docks and kayak launch will be in place by December 2018. Free long distance to anywhere in USA. Elevator access from a secured downstairs lobby to every floor. Complete with 60” 4K high definition TV, and surround sound. Large stainless steel refrigerator with ice maker and cold water dispenser connected to Kinetico reverse osmosis water purification system. Fully stocked with everything a gourmet cook needs. Custom fully stocked kitchen with all stainless appliances including wall oven/microwave, refrigerator, cooktop, and granite countertops. Cable connected television in every room. Little Hickory Bay and the surrounding waters are fantastic for kayaking and paddle boarding. Kayak / Paddleboard rental shop is within walking distance of the condo on Bonita Beach Road. Bring your bicycle or rent one... great sidewalk direct to the Bonita Beach & Barefoot Beach preserve, bars, and restaurants. Private tennis court available for your use. Tennis racquets are available for guest use. The large heated pool has plenty of lounge chairs and umbrella tables for you to enjoy a day of relaxation pool side. Condo also has full sized front loading washer and dryer. Fully stocked kitchen, stainless steel appliances with smooth surface cook top, full size refrigerator, microwave, convection oven, dishwasher, and front loading full size washer / dryer. Living room has 60" flat screen television with cable TV subscription, surround sound stereo system, BluRay DVD player, and Apple TV. Owner lives less than 5 miles away from condo, so in the event of any issues, we are available to quickly resolve for you since we are local to the area. We loved our stay at Bonita Springs. The condo is comfy and we never got tired of the views from every window. The people in the condo building are very welcoming and always pleasant to talk with. The location is perfect. Walking distance to the beach and several restaurants. Easy access to Route 41 which takes you South to Naples and North to Estero and Ft Myers. Lots of places to go, lots of great restaurants to enjoy. Wonderful view of the inlet waterways. Lots of birds, boats and dolphins to watch. Two bedroom condo with all the necessary requirements to make your stay enjoyable. Pool heated and clean. Close to shopping, barefoot beach, restaurants. Any concerns were addressed quickly by the owner. If we go to Florida again, we would certainly look at staying here again. The condo is in a great location, clean and well-equipped, near the beach. We had a wonderful vacation and would highly recommend this property. Upon entering the condo, you will see wonderful views from the many windows. The condo was impeccable with all high end appliances and furnishings. The condo is open and spacious with southwest Florida charm. The view of Little Hickory Bay from the 5th floor provides a panoramic picture of varieties of birds, dolphins, boats, mangroves and spectacular homes. We spent many hours on the lovely lanai watching boaters, fishermen, kayakers, and paddle boarders crossing the bay. The location provides easy access to multiple fabulous beaches on the Gulf, a variety of restaurants, and close shopping locations. The weather was a constant high 70's to low 80's while we were there and every day was sunny! Doug and Lisa should be complimented on their attention to detail and their welcoming nature during our stay. We are looking forward to returning for another relaxing time at this Bonita Springs treasure. FANTASTIC PLACE TO STAY !!!!!!!!!!!!!! This being our first time renting a place for a month in Florida I contacted Doug and asked to see the apartment prior to committing to the rental. This place is top of the line and has everything you need for a wonderful vacation. The people in the condo are extremely friendly they are very active and you will be invited to their gatherings. Every morning I would have breakfast on the Lanai as the sun was coming up and have a second cup of coffee watching the activity on the bay. I missed that part so much I bought my own condo on the water just a few miles south at Wiggins pass. This is truly Paradise and once you leave all you will think about how soon you can return and try to figure out how to stay longer next time. The Little Hickory Bay condominium is located 6 miles west of I-75 on Little Hickory Bay. Walking distance to the public beach is approximately 1/2 mile away. The complex has a large heated pool, tennis court, barbecue area, bike racks, and is close to fantastic shopping, churches, and several major banks. Many nice public golf courses are also in the area. The waterfront condo is fully furnished with top quality furniture and appliances. The unit sleeps 4 in regular beds with a king sized bed in the master bedroom and a queen sized murphy bed in the guest bedroom. There is also a queen sized normal height inflatable bed (made by Frontgate) available for sleeping room for 2 additional for short visits. The unit has 2 full baths, and reserved covered parking. If you would like to bring your boat, the condo has FREE BOAT SLIPS available on a first come first serve basis. On the short boat ride between the docks behind Little Hickory Bay and Wiggins Pass to the Gulf of Mexico, you will not encounter any bridges over the waterways so you don't have to worry about low clearances to go under with your boat. The Gulf of Mexico is a short boat ride via marked inland water channels to access through Wiggins Pass. Condo rules require only 1 renter per month. To reserve, an initial payment of $1000 must be made to commit the reservation. During peak season (January through April), only full calendar months are considered. Background check fee is $50 per adult occupant for new renters only. This fee will be waived for repeat renters to Little Hickory Bay.